A 15mm resilient acoustic layer laminated to a 22mm t&g cement particle board, designed for fitting direct to joist. The slim profile and high acoustic performance options of Acoustic Deck 37 make them ideal for timber floor refurbishment projects. 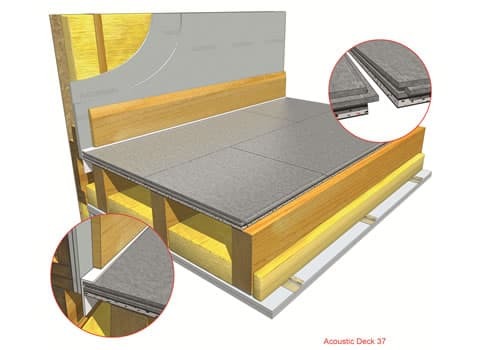 Direct to Joist: Acoustic Deck 37 is specially designed for direct to joist fitment after existing timber floor has been removed. Saves height saves money: After removing existing timber floors, there is no need to lay a new one, which overcomes floor-to-ceiling height issues, saving money and time. Strong and rigid: Suitable for both 400mm and 600mm joist centres and ceramic tiling. Non load bearing partitions can be built off the floor. Convenient: These products are easy to install and always available for fast delivery nationwide. JCW Acoustic Deck 37 has been tested and certified to provide the necessary acoustic insulation required for compliance with part ‘E’ of the Building Regulations for both impact and airborne noise.See data sheet for details of acoustic performance and installation guidance.